and made a website about Bullying. My name is Victoria. 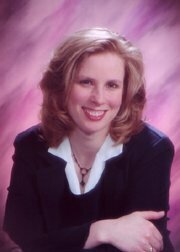 My friends and family call me Vicki and I have been a Life Coach for over 13 years. I am not a “positive affirmation guru” If you say positive things but believe in negative things no amount of positive affirmation will help. I am a results oriented coach. I work with parents to help them and their child deal with bullying to make it stop while minimizing the negative effects. It is a dream come true for me but it wasn't always so rosie. I became a Life Coach because of my past. I made changes one step at a time with the support of wonderful friends. (Karen and Michelle…I am forever grateful for your friendship) I really worked at it…got counseling, saw a psychologist, read every self help book out there…and continued my personal pursuit of happiness. All the while thinking it would be easier if I had someone to help show me the way. Then I read an article about Life Coaching and ‘AHA’ realized that was my calling. Life Coaching is definitely a passion. I get to help people create the lives they want. We work together to set goals and live a life that is authentic. A coach holds the space of 'what is possible' and helps you figure out how you can make the possibility a reality. I get to meet wonderful people and have an impact on their lives. Like Tara, a young women making important decisions about what to do with her life. "This winter was really special for me and meeting Vicki has made a huge and wonderful impact on my life now and the life I want and what I want to be become. And it will allow me to have the life I want to live" Tara Telkwa BC. Increasing life skills, helping people connect to build better relationships and solving problems with unique perspective and a variety of strategies that make the transition smooth and easy. Most successful people have a life coach working with them or have had...even Oprah!! "I love how you challenge other coaches (using your coaching skills) and suggested what they might need and offered them something that will stop them and have them think... lots of powerful coaching and teaching here. Great job and I thank you. Keep using your strong coaching skills to rock the world." Since answering the call to become a Life Coach I have experienced a lot life challenges. Broken relationships, betrayal and pain, the birth of my first daughter, post partum depression, my marriage to my wonderful husband, the birth of my second daughter. A cross country move from Ontario to British Columbia then an International move to Cairns, Australia and back to Ontario…Busy Life. Too Cute...Is this bullying ?? 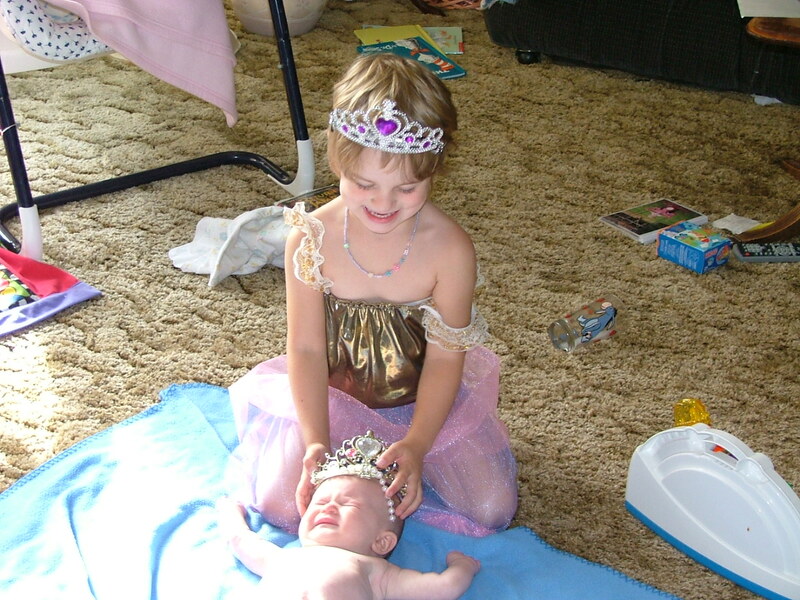 Nahh, Just My oldest Evan trying to convince her little sister Ellie to play princess!! I eventually had my gall bladder removed. Then we moved to Australia and had many more adventures but on a Guardian visa I was not allowed to work. 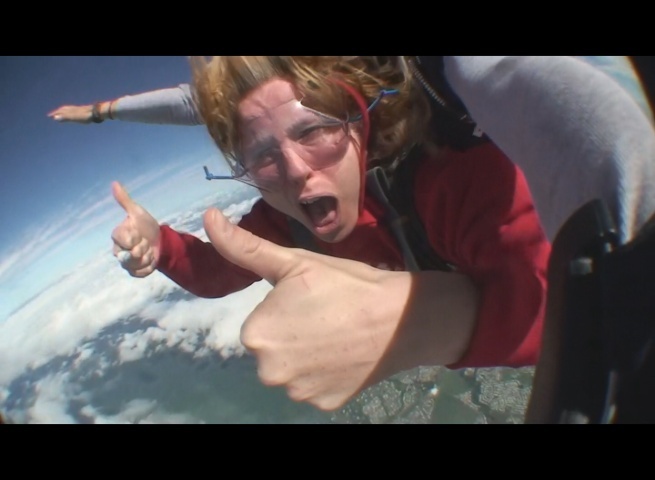 Skydiving in Australia as a Birthday gift to Me. We are now nesting comfortably in our beautiful, 100 yr old, 2400 sq ft home back in Canada. I took a Government job that paid the bills and afforded our family some flexibility financially. However, once settled and sorted in the new J.O.B I quickly discovered it was not meeting my needs… Sure it paid the bills but there is more to life than that?? I became depressed. With all my heart I wanted to coach and help people. I was at an impasse. I live in a small Northern Community. The local population cannot support a full Life Coach Practice. Of course, the other side was I had no focus, was not sure who I wanted to coach and was depressed. Any one who knows me understands focus is not my strongest trait and dealing with depression and many health concerns has been challenging. It was SBI that really helped me to get focused and I am thrilled to finally…after many years be on track and able to help families struggling with Bullying. All this virtually and working around my job. It has been a slow process…I began back in 2012. My biggest passion is to Coach people especially where there is an injustice. Raising my family, creativity, adventure and new experiences are high on my list of priorities. My biggest fear is that life will pass me by while I'm busy paying the bills. I have wanted to help people providing life coaching to make lives easier for the past 13 years. The thought that my 9 to 5 job and life in this good old mining town might be all there is...deepened the depression. I had no time and no energy to start a Life Coaching Practice. I was barely managing to build the website. I had a full time job and family to take care of. The depression I was suffering from worsened.… It seemed my dream of helping people with coaching would never be a reality. Everyone kept saying wait till you retire…wait till the kids are older…put your dreams of living in sunnier climates and exploring new cultures on hold. My job pays the bills, but it doesn’t exactly inspire me. Between work, house renovations, taking care of the kids, keeping my ½ acre yard of grass cut or worse snow shoveled… and looking after our pets including 3 birds, a ferret and a pug. There wasn't much time and energy left...I already had an endless “to do list” Sound familiar?? ...and 13 years later here I was, in the same situation as so many other people: stuck in the 9 to 5 job that was paying the bills but I was not happy doing it. LUCKILY, The depression worsened and my health took a turn for the worst… I had to take a sick leave...sometimes our biggest set backs can be our best inspiration. It has slowed me down and given me time to think and reconnect with the importance of coaching. I am on the road to recovery thanks to the support of my wonderful husband, The Lockwood Clinic, my family Doctor, the local Canadian Mental Health Association , a Nutritionist, a Psychiatrist, my two girls and my best friend. Yes, it takes a team to deal with depression effectively. The healing is far from complete but I feel I am going in the right direction thanks to my Coach and in large part due to this website. I feel like I am contributing and working to resolve a huge injustice. Using my hard earned coaching skills to make a difference. Bullying is not a part of growing up. I believe we as parents can work together and we can Free the World of Bullying. One bullying situation at a time if that is what it takes. Sounds unrealistic? I assure you, it's not. If I learned one thing in life it's that nothing is impossible! Think about your life. What is it that you really want from it? And turn off the little voice that keeps saying, "It can't be done." It can. "I will find work that contributes, that I am happy to do, that pays the bills and more and allows me to focus on my family, travel and creativity and I will still be happy doing it twenty years from now." The Solution...is so simple, I wonder why it took me so many years to find it: Make a living doing what you love! As a Life Coach you would think it would have been obvious but it took time. I needed to adjust my thinking and the HOW of what I wanted to accomplish. You can do it too. I'll show you how I'm doing it. My passion is Life Coaching, but you can do what I'm doing with any passion, hobby, skill, area of expertise... whatever it is that makes you happy. And you can do it in your spare time! And if you allow me to step into a coaching role for a second...Who are you to keep all that passion, expertise and skill from the world?? Share a little eh? Somehow, I don't even remember how, I stumbled across SBI. I just never realized what a life line it would be. SBI stands for Solo Build It! and helps you to turn any hobby, passion or skill into a viable online business. You probably don't even realise that almost any topic can make money with a website. Build a website?! Exactly. Remember, I am totally non-techie and did not know anything about website building let alone how it could generate money. This website was built with SBI, so you see... anyone can do it. SBI will help you find the perfect topic for your site, to build it, to get traffic to it, and then they even teach you how to make money with it, no matter what it is about! I started the very website you are on right now in October 2012, and I am just now editing it and preparing various ways to monetize it. I have the J.O.B to pay the bills for the time being but I am optimistic this site will provide a solid second income and eventually replace the J.O.B and I am genuinely helping people. How much better can it get? Yes, in the beginning this is a lot of work. But keep in mind that doing something you love never feels like work. And you can do it in your spare time like I did until recently. YOU set the pace. How do I make money? At the moment mostly with advertising. I am in the process of creating links throughout the site that say "Ads by Goooogle". Every time someone is interested and clicks on one I will make money. There are countless other ways to make money with a website: create your own e-goods to sell, affiliate sales, get paid for leads and referrals and more. SBI shows you how to do all that. If you still have questions or concerns they can be answered by the excellent support staff. Try SBI- because if I can do this, you can!